WheelTurnerHawaii.com: HawaiiWinterOutlawSeries Presents The Maui Challenge VIDEO. 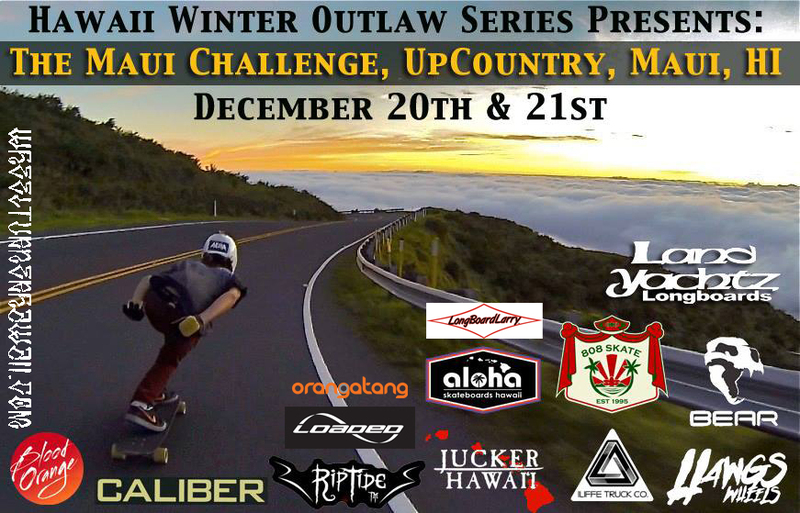 HawaiiWinterOutlawSeries Presents The Maui Challenge VIDEO. Last month the 2nd event of the 2014 - 2015 Hawaiian Winter Outlaw Series went down over on Maui and it was pretty EPIC to say the least. Maui boys Dakota Camp and Zach Newman killed it at getting together an event that was ALL TIME to anyones standards. All racers got to skate a ton of runs all day on, what i consider one of the best roads in the world. A beautiful, narrow, butter smooth squiggle of blacktop through a jungle that'll make you dizzy it has so many turns. Oh and there happened to be "road maintenance" during the time of the event which resulted in a fully closed course to cars. I told you it was all time. Team Shoots member and WheelTurnerHawaii ambassador Kaimana Pinto was there to capture some insane footage of the event during the final few rounds. Sit back and watch some gnar bar racing go down. We want to send a HUGE mahalos to all of the sponsors who helped make this possible. The next and final event of the Hawaii Winter Outlaw Series is THE SCORCHER which will be going down on Jan 17 alt. 18, 2015. More event details will be posted soon!